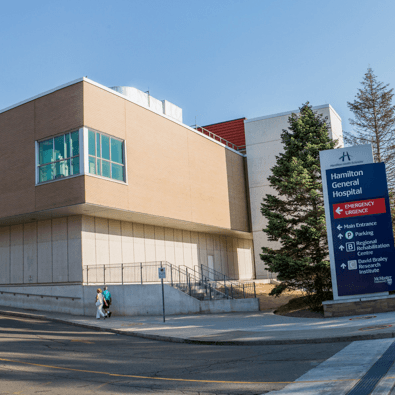 Hamilton General Hospital is home to our region’s hyperbaric medicine program, which provides special oxygen therapy for patients with a variety of health conditions. When you receive hyperbaric oxygen therapy, you will lie inside an enclosed chamber. A doctor and nurse will monitor your treatment from outside the chamber. The air pressure inside the chamber is increased which allows your body to take up more oxygen. Do not drink any carbonated beverages (such as soda pop) within one hour of the start of your treatment as this could cause stomach pain. Avoid food and drinks with caffeine too. Do not smoke during the course of your treatment. Smoking reduces the amount of oxygen your blood can carry and will reduce the effectiveness of the treatment. If you drink alcohol, please discuss this with the doctor. Excessive alcohol intake over the course of your treatment could put you at risk for a seizure. If you have diabetes, please eat your regular breakfast, and tell the therapist your morning blood sugar result. Tell the therapist if you did not sleep through the night before your treatment. You cannot eat while in the chamber. This includes chewing gum or sucking candies. You can wear your eyeglasses. We will give you a bottle of water to drink and a bed pan to use in the chamber if needed. Tell the therapist right away if you become nauseated before or during treatment. Books and magazines are not allowed inside the chamber. However, a television is available for viewing and you can hear the sound inside the chamber. Appointment length: A typical treatment lasts between 2-2 ½ hours. The number of treatments you will need depends on why you are having hyperbaric oxygen therapy. Your doctor will discuss your treatment schedule before it starts. Before you leave: Please review your next scheduled treatment time with staff. We understand that reaching us by phone can sometimes be difficult. Often our phone lines are busy or are turned over to the message centre so our staff can prepare for clinic visits or help other patients. For urgent appointment-related issues only contact: 905-521-2100 ext 46344. Will I need to sign a consent form? You will be asked to sign a consent form for hyperbaric oxygen therapy. Before this, the doctor will explain the risks and benefits of the treatment. What will I feel during the hyperbaric oxygen treatment? As the chamber is pressurized, you may feel a rise in the temperature. You will hear the oxygen coming into the chamber. It may sound like hissing or a waterfall. You will feel a fullness in your ears as your eardrum is exposed to the pressure change. This feeling is similar to that felt in an airplane. The therapist will teach you how to deal with this. Never allow your eardrums to become painful. Always tell the therapist if you are having problems adjusting to the pressure change. Also, in rare cases, too much oxygen can disturb the brain. Please let the therapist know if you feel anything out of the ordinary, such as vision or hearing changes, nausea or twitching, during your treatment. You do not have to do anything during the treatment. During the treatment you may lie on your back or side and you can adjust your position if you wish to. You will be able to watch television during the treatment. Side effects are rare, but some people have nausea, an ear ache, and vision changes during treatment. Do not change your eyeglass prescription since the vision changes are temporary and your vision will return to normal. Why is my wound painful? The treatment is causing an increase in the flow of blood to the wound. This may increase pain but this is a sign of the healing process. If you need to rebook, please call the Hyperbaric Medicine Department as soon as you can.